19/441 Private Wilkinson Bestford, 19th Battalion, the Durham Light Infantry was killed in action 19 August 1917 and is buried at Templeux-le-Guerard British Cemetery. He is commemorated on the West Auckland War Memorial and the Roll of Honour in the West Auckland Institute. Wilkinson Bestford’s older brother 19466 Private John Bestford, 10th Battalion, the Yorkshire (Alexandra, Princes of Wales’ Own) Regiment was killed in action 28 May 1916 and is buried at Dartmoor Cemetery, Becordel-Becourt. In 1901 the family lived at East View West Auckland where Robert worked as a coal miner (hewer). 19 year old Isabella was employed as a domestic servant. In 1911, the family lived at 11 East View and all the men including 15 year old Wilkinson worked as coal miners. 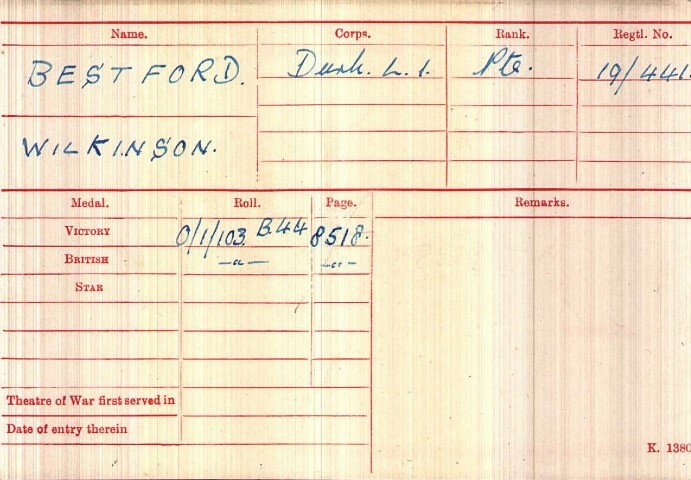 Wilkinson Bestford attested at Bishop Auckland 27 February 1915 aged 19 years 8 months. He worked as a miner and lived at 11 East Green, West Auckland. He undertook a medical examination 27 February 1915 was 5ft 1” tall, weighed 112 lbs and was considered fit for military service. He joined the 19th Battalion, the Durham Light Infantry being given the regimental number 19/441. 15 July: 19/DLI came under the orders of the 9th Division then engaged in the struggle for Longueval and Delville Wood. They were in trenches at Montauban and came under heavy shellfire. 18 July: evening, 19/DLI was called upon to assist the 26th Brigade to attack a portion of Delville Wood retaken by the Germans but orders were cancelled. They suffered a heavy German bombardment before being relieved by the Royal Scots Fusiliers 20 July. 29 July: evening, 106th Brigade assembled as reserve to the 89th Brigade which was to attack 30 July the German front line south of Montauban from the Malzhorn Farm – Guillemont Line. Gas and tear shells caused severe discomfort during the night. Little seems to have been achieved other than losses to the battalion amounting to 12 officers and 250 men. Later research records that between 14 and 31 July 19/DLI lost 1 Officers and 63 Other Ranks killed in action or died of wounds. Between 3 September and 16 November 1916, Private W. Bestford was receiving medical attention at 106 Field Ambulance and 37 Casualty Clearing Station. 1917: 20 May – 16 June: the Pursuit of the German retreat to the Hindenburg Line. 5/6 May: Y & Z Companies were detailed to attack the new German line and Les Trois Sauvages Farm which was between Gricourt and the main St. Quentin-Cambrai road. Private W. Bestford served in Z Company. The attack was made in pouring rain, the enemy rifle fire was heavy, the shrapnel barrage “lagged” and wounded some of their own men then a heavy hostile enemy barrage fell upon the second and third waves of the advance. German trench mortars opened up. The farm had been untouched by the British artillery fire and was strongly held. Some of Z Company reached the wire in front of the German trenches. Losses were heavy all along the line and there was no hope of success but 19/DLI held on before bring ordered to withdraw. Losses in the ranks amounted to 58 and 1 officer died of his wounds. Later research records that between 5 and 7 May 19/DLI lost 18 Other Ranks killed in action or died of wounds. Second Lieutenant G.F. Blenkinsop (recorded as serving with 15/DLI but quoted in Miles as taking part in this action) died of wounds 7 May 1917. After a quiet tour of the trenches opposite Hennecourt, 19/DLI withdrew 2 June to divisional reserve at Aizecourt-le-Bas. The battalion moved up to Brigade reserve positions at Gauche Wood 10 June. There followed another series of tours of the front line with 26 casualties, mostly from bombardment before being relieved 23 July. Between 22 June and 2 July Private W. Bestford was on leave. 1 August: 19/DLI moved to reserve positions in the Birdcage Sector, southwest of Epehy. The line 8000 yards in length faced the Hindenburg Line. 19/DLI had an uneventful tour on the left of the line. Between 1 and 24 August 1917, 19/DLI lost 19 Other Ranks killed in action or died of wounds including Private W. Bestford who was killed in action 19 August 1917. The 19/DLI War Diary has not been consulted thus the circumstances surrounding his death remain. It is assumed that he was the victim of the usual violence of warfare, possibly shellfire. Private W. Bestford served a total of 2 years 174 days, 1 year 201 days in France. He was awarded the British War and Victory medals. 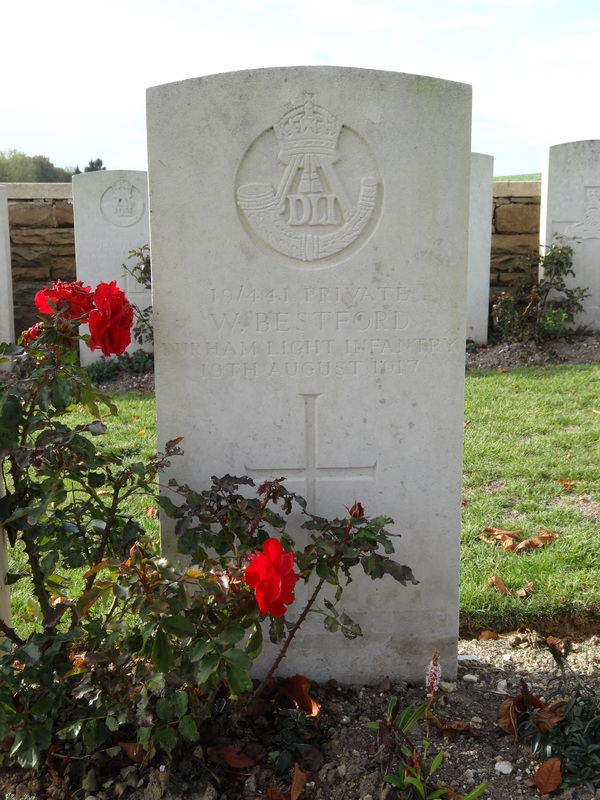 Private Wilkinson Bestford is buried at grave reference II.G.10 Templeux-le-Guerard British Cemetery. After the Armistice 360 graves were brought in from the battlefields of April 1917 and March and September 1918 surrounding the village and in 1930 the British graves from the following 2 cemeteries Gouy British Cemetery and Ste. Emilie British Cemetery, Villers-Falcon were brought in. Private W. Bestford’s body was reinterred from Ste. Emilie British Cemetery. There are now over 750 WW1 burials in the cemetery.